So I’m sure you have all heard by now that App-V has made its way into Windows 10! This is a major milestone for the product and should pave the way for a much larger scope of adoption across the enterprise. As somebody who has worked with App-V for a while now its great to see it mature to the point whereby it will now be included as part of the OS platform. You can expect to find to the same features that you are used to in App-V 5.1 (for now) but once fully in box in the public release I would guess the development and delivery of updates to be far more streamlined via Windows Updates. Another interesting point of note is UE-V has also made it across too, while some people might say this is probably just because it was an easy candidate to bring along I would argue that its complimentary nature to App-V is a big reason it has made it in box. Conversations in the enterprise around App-V and UE-V will be somewhat bolstered when IT teams can state the client is essentially already rolled out and ready by default. When trying to understand the future of App-V now it wouldn’t be misguided to look at other features that have been included in Windows such as BitLocker which eventually became a household name across all SKUs. 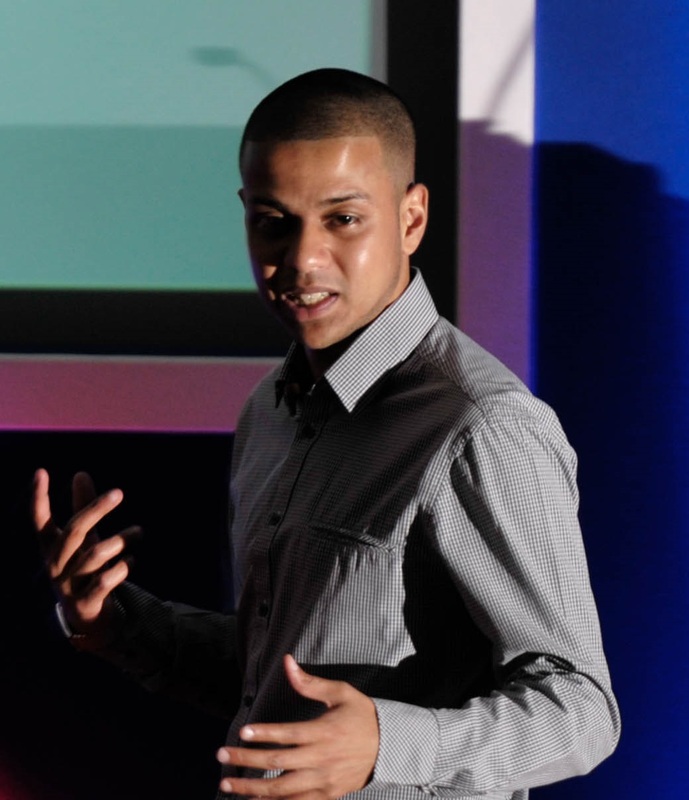 This development puts App-V on the big stage, now its up to the product to sing and engage the masses! 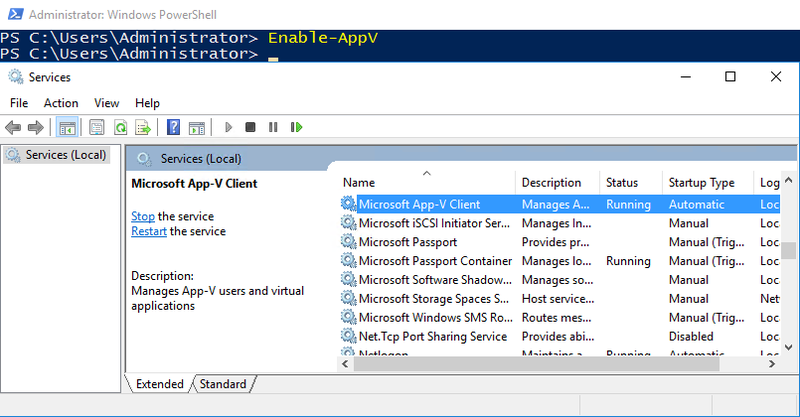 As the current implementation is only on the insider preview build at present some of the finer details may change before this all goes live but for a full rundown on the current integration of the client check out Aaron Parker’s brilliant post here. 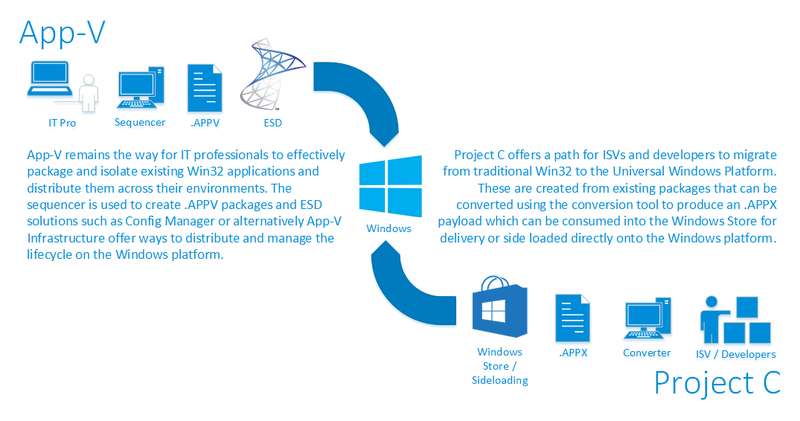 Project C was initially talked about around a year ago at Build 2015 and put forward as a bridge for ISVs to get their applications over to the new app model built upon the Universal Windows Platform (UWP) still running Win32/.NET code. Applications that support the UWP model can take advantage of features and integrations of the modern platform such as live tiles not to mention presence in the Windows Store. Microsoft are keen to inspire and attract developers towards the Windows Store as a key part of the modern OS and how consumers will install applications. Things went pretty quiet publicly on Project C for a while however a few weeks ago at Build 2016 the guys at MS shared some new developments, namely a conversion tool allowing conversion of traditional Windows applications to the new .APPX format. Converting Win32 applications over to the .APPX format puts them on the path to potentially become fully fledged Universal Windows Applications (UWAs) which unlocks the possibility for apps to be used across different types of Windows devices such as phone, Xbox and HoloLens. The converter to be clear will not make your application a UWA, rather it will allow it to migrate to UWP as described on MSDN here in the form of an .APPX. So, since the announcements around Project C I have heard a lot of questions around the potential conflict with App-V. The short answer is while there is most certainly an overlap from a technology standpoint, the two work streams have different goals and benefits to different audiences. .APPV and .APPX share the same underlying format and therefore have many commonalities, I personally don’t assume that to mean that one will eventually override the other in the longer term, rather that the formats will more likely intersect and support each other going forward, it’s all pretty much the same under the hood. In fact even now many of the Project C demos seem to have underlying App-V technology running them and many of the concepts talked about at Build are ones us App-V guys have been familiar with for a while now. Enterprises who are using or start using App-V are putting themselves on the path for the future. The same can be said for ISVs who begin to move towards UWP. Thanks TK for the input.